I said that I would try this pattern in a bigger size; now I have. This one is 120% and it has been finished for a while now, but today I had the perfect excuse to post about it – Keyka Lou is having a pattern sale at her shop! It’s a fantastic any two patterns for 10 USD, definitely worth it! I haven’t used it myself because I’m trying to hold back on this kind of thing *blush*! 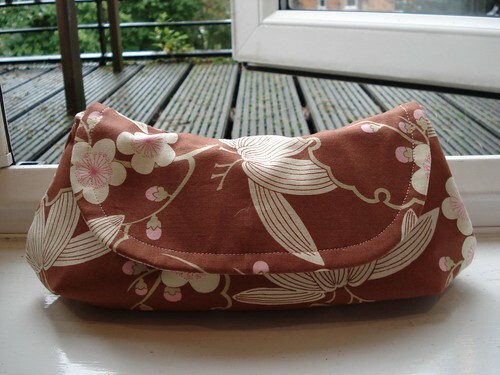 About the clutch – 120%, Amy Butler Trailing Cherry Blossom Cotton Fabric, no strap. The reason for the no strap option was an involuntary one – I simply forgot to attach the strap foot thingy. Such is life! Size wise, I’m quite pleased with this one and probably won’t make it any bigger! Acho sim! Este tecido encontrei no ebay, nao procurei especificamente por Amy Butler. Infelizmente, percebo pouquissimo de designers e acabo por comprar tecidos quando gosto, sem qualquer relacao com designers. Mas concordo inteiramente com o que dizes, muitas vezes e o que esta na moda que vai.